Medical Image Segmentation is the process of automatic or semi-automatic detection of boundaries within a 2D or 3D image. A major difficulty of medical image segmentation is the high variability in medical images. First and foremost, the human anatomy itself shows major modes of variation. Furthermore many different modalities (X-ray, CT, MRI, microscopy, PET, SPECT, Endoscopy, OCT, and many more) are used to create medical images. The result of the segmentation can then be used to obtain further diagnostic insights. Possible applications are automatic measurement of organs, cell counting, or simulations based on the extracted boundary information. Segmentation of cerebral vessels and subsequent use for numerical blood flow simulations. 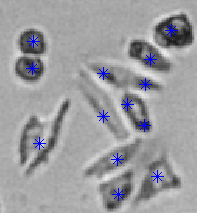 Detection of cells in bright-field microscope images. Segmentation and modelling of the coronary vessel tree in intra-procedural data for quantitative measurements. Developing patient-specific cardiac models, estimated from available multi-modal images, to enable advanced clinical applications for the management of cardiovascular disease. Detection of patient characteristics from resting state functional magnetic resonance images, with a focus the early diagnosis of Alzheimer's disease.